Laparoscopic paraesophageal hernia repair (LPEHR) has been shown to be both safe and efficacious. Compulsory operative steps include reduction of the stomach from the mediastinum, resection of the mediastinal hernia sac, ensuring an appropriate intra-abdominal esophageal length, and crural closure. The use of mesh materials in the repair of hiatal hernias remains controversial. Synthetic mesh may reduce hernia recurrences, but may increase postoperative dysphagia and result in esophageal erosion. Human Acellular dermal matrix (HADM) may reduce the incidence of hernia recurrence with reduced complications than synthetic mesh. METHODS: A retrospective review of all cases of laparoscopic hiatal hernia repair using HADM from December 2008 through September 2009 at a single institution was performed evaluating demographic information, bmi, operative times, length of stay, and complications. RESULTS: 25 LPEHR with HADM were performed. The mean age was 58.4 years (+/- 13.7); BMI 31.0 (+/- 5.8); operative time 191 min (+/- 68); and length of stay 2.3 days (+/- 1.9). 6/25 (24%) patients experienced complications including subcutaneous emphysema without pneumothorax(1), urinary retention(1), COPD exacerbation (2), early dysphagia resolving prior to discharge(1), delayed gastric perforation occurring 30 days postoperatively associated with gas bloat syndrome. No patients reported regurgitation or reflux postoperatively. 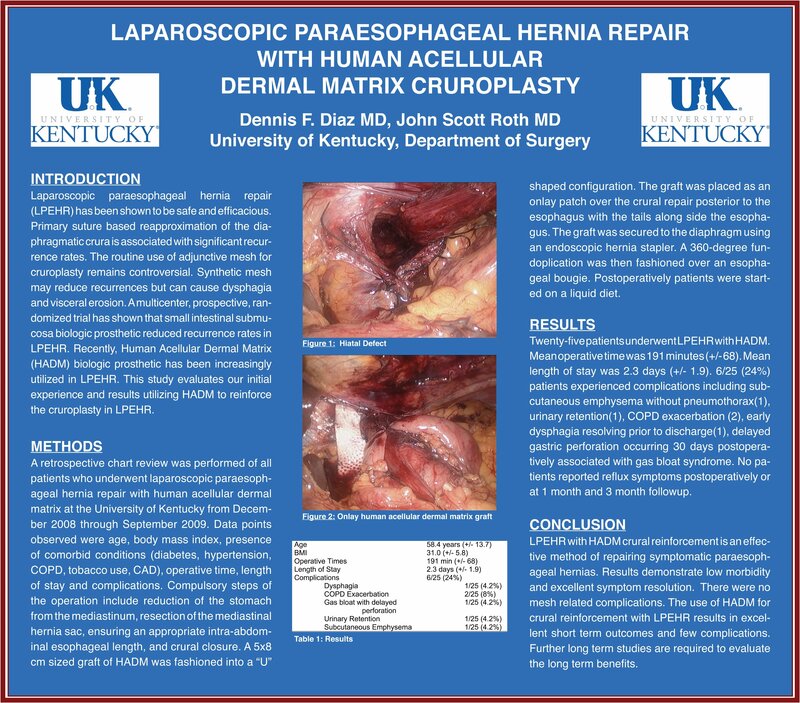 CONCLUSION: LPEHR with HADM crural reinforcement is an effective method of repairing symptomatic paraesophageal hernias. Early results demonstrate low complication rates and excellent symptom resolution. HADM does not increase early postoperative morbidity and may decrease recurrence rates.